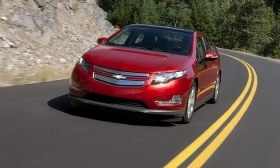 When running in extended range mode, the Chevrolet Volt gets about 38 mpg. General Motors Co.'s much-anticipated, highly publicized grab for technological superiority in the burgeoning electric-vehicle segment, the Volt represents some three years of intensive engineering and development work to take a novel concept from the drawing board to the reality. The car features what GM says is a pure electric vehicle drive system in which the first 35 to 50 miles come from battery power charged from a standard 120-volt outlet or a 240-volt power plug. It's only after that electric range is depleted that things get really interesting in the Volt, as a 1.4-liter four-cylinder gasoline engine cranks up to send more juice to the drive motor and to maintain a base level of charge in the car's 400-pound, T-shaped lithium-ion battery. Now that GM, with patents in hand, has cleared the air on exactly how the Volt operates, engineering wags and automotive journalists are abuzz with arguments over whether the Volt is a pure electric vehicle or some variation that at some point connects the internal-combustion engine directly to the drive wheels via a generator-motor and a gearset. For 99.9 percent of the driving public -- and for Volt buyers -- that discussion is irrelevant, especially considering how remarkably well the car actually does what GM said it would do: run on stored battery power or on range-extending, onboard-generated electric power, without any of the worries of having a dead battery that leaves you sitting by the side of the road. As long as you don't run the 9.3-gallon gasoline tank dry, you'll never be stranded. The car's beauty lies in its normalcy. It rides comfortably and quietly, steers adequately, brakes sensationally and handles without too much battery-weight-induced roll. Only when the battery runs down and the driver's right foot demands hard acceleration does the onboard gasoline engine run at peak revs, with its sound permeating the cabin. Most of the time, the engine speed is deliberately matched to the pedal position, not to provide varying power but to simulate the sounds a driver would expect from a normal internal-combustion-engine vehicle. It's a lot like driving a high-torque, four-cylinder, gasoline-engine sedan similar in size to the Chevy Cruze, with which it shares underpinnings. If you're an early-adopter type, you probably already have a reservation for one of the unique four-seat hatchbacks that will start rolling off the assembly line in Detroit in about a month. For the rest of the buying public, it'd be smart to assess whether your daily driving habits lend themselves to getting the most out of the Volt. If you're like 80 percent of Americans who drive less than 40 miles back and forth to work each day, all your power should come from household recharging, so you'll never spend another dime on gasoline for your daily commute. But if you drive farther, forcing the gasoline engine to provide power for the extended range, fuel economy is realistically in the 38-mpg area -- not the best on the planet by a long shot, and certainly not class-leading for the kind of money you'll plunk down for a Volt. On the other hand, 38 mpg is nothing to sneeze at for a car that costs you pennies to operate on short trips but is capable of going on a cross-country road trip without having to worry about locating the next power outlet.